Ilavarasan Cankili Kumaran was the elder twin son of Ilavarasan Gago Pandaram and Ilavarasi (first name unknown), daughter of King Arya Cakravartti Puvi Raja Pandaram Pararacacekaran. Cankili Kumaran was very handsome and had a courageous personality. He was the grandsons of King Periya Pillai Cekaracacekaran (1570-1582) and King Puvi Raja Pandaram Pararacacekaran (1561-1565 & 1582-1591) and he was also the great-grandson of King Cankili Raja (I) Cekaracacekaran (1519-1565). Ilavarasan Arasakesari Pandaram, served as Prince Regent for his nephew Dom Constantino, who had not yet reached the age of three years and he remained heir to the throne. But this prosperity lasted only for a short time. It was not long before a conspiracy led to assassination of the Prince Regent. In 1616, Cankili Kumaran ordered his confederates to enter the Royal Palace and to kill the Prince Regent Arasakesari Pandaram, his Uncle, and those who were with him. Cankili Kumaran forthwith ordered the Princes to be killed and he usurped the throne of his cousin Dom Constantino. Ilavarasan Cankili (II) reigned from 1616 to 1620, under the throne name of Cekaracacekaran. During the reign of Cankili (II) Cekaracacekaran, there was disquiet in the regime. King Cinkai Arya Cakravartti Ethirmanna Cinkam Pararacacekaran died in April 1617, leaving his young son Dom Constantino as his heir. The setting up of a regency to administer the Kingdom on behalf of the deceased ruler's young son led to the emergence of three factions seeking to influence or control the exercise of power the legitimists, who rallied round the heir and his lawful guardian, a party of Christian Mudaliyars, planning for a Portuguese takeover of the Kingdom and a party favouring Cankili (II) Cekaracacekaran, a nephew of the deceased ruler. In the tripartite struggle for power, Cankili (II) Cekaracacekaran, eventually won control of the Kingdom and thereafter he ruled the Kingdom of Jaffna with full power and authority. It was in 1619 that the Portuguese made their move to conquer Jaffna under Filipe de Oliveira. Cankili (II) Cekaracacekaran was the last reigning Monarch of Jaffna, he was captured and the Kingdom of Jaffna was occupied by the Portuguese. Cankili (II) Cekaracacekaran was a brave and fearless ruler who had fought against the Portuguese till the very end. Cankili (II) Cekaracacekaran had many wives. Cankili (II) Cekaracacekaran and his wife, whose first name unknown, had a son named Pararasa Pandaram (a.k.a. Peter), and his son Veera Bahu (a.k.a. Vincent), had a son Puviraja Pandaram, and his son Gurunathar, who in return had a son Vedanayagam Mudali, whose son was Vedanayagam Thambiah Mudali. Vedanayagam Thambiah Mudali, son of Vedanayagam Mudali, was born in Manipay, Jaffna. He belonged to the Arya Cakravartti Dynasty and was proud of his ancient lineage. Vedanayagam Thambiah Mudali was brought up under the strict guidance of his father. He was well educated and was a Chief Postmaster at Manipay in Jaffna. Vedanayagam Thambiah Mudali had a son named Thambiah Cadiravel Mudali and a daughter named Chellammah Nachchiyar. Vedanayagam Thambiah Mudali was Raja Remigius Kanagarajah’s maternal great-great grandfather. Vedanayagam Thambiah Mudali had inherited the properties from his ancestors in Jaffna and Pundaluoya. The answer to how Vedanayagam Thambiah Mudali came to own so much lands in Pundaluoya, is that his great-great-grandfather Veera Bahu (aka Vincent), the grandson of Cinkai Arya Cakravartti Cankili (II) Cekaracacekaran (1616-1620) lived in Pundaluoya because he was in hiding from the Portuguese and Dutch during the colonial rule. The Heritage of Ambagastenne Tea Estate and the Bungalow is located in Pundaluoya. Most of the Ceylon tea gardens are situated at elevations between 3,000 and 8,000 feet above the sea level. Pundaluoya is also known as Punduloya, Pundaloya, and it is located in the Central Highlands of Sri Lanka. The Beautiful two storey Bungalow was built in the shape of the letter “T”. There was a beautiful large garden and a big pond filled with Lotus. The bungalow is surrounded by hills, tea plantations, green paddy fields, forest and streams. The Harrow Tea Factory, planter’s club and the property of Mr. Ponniah Edwards alias John Edwards are located near the bungalow. The beautiful Dunsinane waterfall is near the Pundaluoya town, measuring about 92m in height. It belongs to the group of twenty most spectacular waterfalls in Sri Lanka and the Amman Hindu Temple is located on the bank of the waterfall. Vedanayagam Thambiah Mudali built several temples and he developed Pundaluoya from the beginning. The Crown Lands are the private lands of the Royal Family of Jaffna. The Lands and the Bungalow shall not to be sold, transfer, leased or disposed of in any manner. Thambiah Cadiravel Mudali, the eldest son of Vedanayagam Thambiah Mudali, was born in Manipay, Jaffna. He had a great personality. Thambiah Cadiravel Mudali was first married to the daughter of Mudaliyar Kanagaratnam Thambithurai and Nagammah of Nallur. They had a son and he died at the age of seven. Thambiah Cadiravel Mudali married for a second time to his first wife’s sister, Ilavarasi Annapoorani Nagamuttu. She was the fifth child in the family and was a very conservative person. It was customary in royal families to keep the royalty within the family and they had royal intermarriages. They lived in their ancestral home in “Cankili Thoppu” in Nallur, Jaffna. Thambiah Cadiravel Mudali and Ilavarasi Annapoorani Nagamuttu Cadiravel were Raja Remigius Kanagarajah’s maternal great-grandparents. Due to the situation that time, Ilavarasi Annapoorani Nagamuttu Cadiravel lost seven children at birth. Later they moved to Malaya (Malaysia) and Thambiah Cadiravel Mudali served in the Malayan Railways as a Station Master and also lived in Penang and Kuala Lumpur in Malaya. 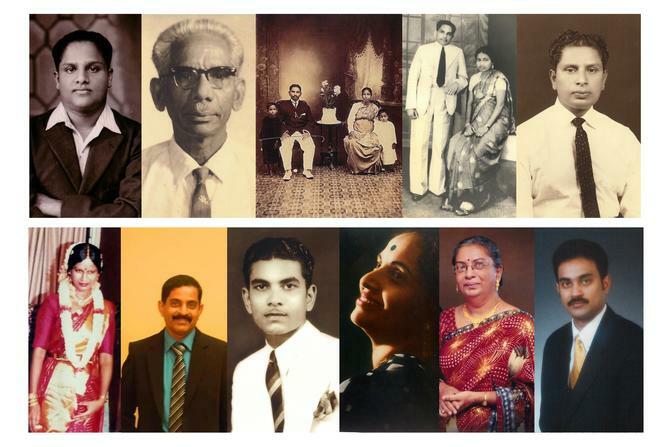 Finally, they had four sons named T. C. Arasaratnam born in Malaya, T. C. Navaratnam Selvarajah born in Seremban, Malaya, T. C. Nadarajah born in Nallur and T. C. Thambirajah born in Malaya. Thambiah Cadiravel Mudali also owned a large Mansion called “Pavala Vaasal” in Chemmani Road in Nallur, Jaffna. It was a traditional style mansion with nine rooms and with a courtyard. Thambiah Cadiravel Mudali lived a lavish lifestyle. He followed the traditions and customs of his ancestors and made many charitable donations. In the Hindu tradition, there are many festivals that are observed throughout the year. During Hindu festivals and other special occasions many people, visit “Pavala Vaasal” to receive their blessings from Thambiah Cadiravel Mudali. Keeping with royal traditions he handed out sweets, gifts and gave them his blessing. Thambiah Cadiravel Mudali was a pious devotee of Lord Shiva and worshiped him all the time. After his retirement, he had a keen interest in the Siddha system of medicine. The Siddha system of Medicine is considered one of the most ancient traditional medical systems and it originated in the state of Tamil Nadu in South India. The Siddha system of medicine is called “Saiva Sampradayam” (tradition of Lord Shiva), and was practised in Jaffna. It considered best suited to the climatic conditions of Jaffna and Thambiah Cadiravel Mudali spent his spare time on researching plants and herbs. Thambiah Cadiravel Mudali maintained the glorious traditions of his ancestors throughout his life and his death was a great loss to the family and to the Tamil society. Ilavarasi Annapoorani Nagamuttu Cadiravel and Villavarayar Sinnathamby Pulavar (1716-1760) of Nallur, were cousins. His father Mudaliyar Naganathar Villavarayar was a highly educated person who was held in great respect by the people and the Government. Mudaliyar Naganathar Villavarayar was the son of Mudaliyar Naganathar of Nallur and he was a descendant of Cinkai Arya Cakravartti Pararacacekaran (1478-1519). Dr. Elangai Murugesu Vijayaretnam Naganathan, (MP) (1906-1971), who was residing at his ancestral home in “Cankili Thoppu” in Nallur, Rear Admiral Rajan Kadirgamar, MVO. SL Navy and Sir Chittampalam Abraham Gardiner (1896-1960) were nephews of Ilavarasi Annapoorani Nagamuttu Cadiravel. Ilavarasi Annapoorani Nagamuttu Cadiravel was closely related to Navaliyoor Somasundara Pulavar (1876-1953), Rev. Fr. S. Gnanaprakasar, OMI, (nee Vaithilingam), son of Rajasingham Swaminathar and Thangamuthu. His father Rajasingham Swaminathar was a devout Hindu and the Custodian of the "Velakkai Pillaiyar Temple" in Manipay. Rajasingham Swaminathar was a teacher by profession and was a descendant of Cinkai Arya Cakravartti Puvi Raja Pandaram Pararacacekaran (1582-1591). Rev. Fr. S. Gnanaprakasar's mother, Thangamuthu was the eldest daughter of Vidane Vairamuttu Sittampalam and he was the son of Vidane Vairamuttu. Ilavarasi Annapoorani Nagamuttu Cadiravel was also related to Sir Ponnambalam Ramanathan (1851-1930), Rev. Fr. P. J. Jeevaratnam, OMI, (Rector of St. Henry’s College Ilavalai, Jaffna) and to T. Chinniah Yogakumaran (Superintendent of Police, SLPR) of Chundikuli. Ilavarasan T. C. Arasaratnam was the eighth son of Thambiah Cadiravel Mudali and Ilavarasi Annapoorani Nagamuttu. He had three younger brothers, Ilavarasan T. C. Navaratnam Selvarajah, Ilavarasan T. C. Nadarajah and Ilavarasan T. C. Thambirajah and they resided at “Pavala Vaasal” in Nallur, Jaffna. They were raised under strict supervision of their maternal grandmother and governess. All four brothers were well educated at St. John’s College in Jaffna and they were brilliant students. The four brothers maintained very close family ties and they had passion and interest for sports. Ilavarasan T. C. Arasaratnam was very talented and during his school days, he was extremely well known for his speeches and he was also a member of the Court Jury. Ilavarasan Thambiah Cadiravel Arasaratnam was a Chief Post Master at Point Pedro in Jaffna, later he was at Colombo Secretariat Post Office and also served in other places. Ilavarasan T. C. Arasaratnam married his first cousin, Annammah, daughter of Chellammah Thambiah Nachchiyar and Zamindar Ramasamy Sangaralingam Caruppiahpillai of Kaveripoompattinam, India. She was beautiful, kind, very generous and caring person. Ilavarasi Annammah lost five children at birth and they were blessed with four children, three daughters named Maheswary, Yogeswary and Rajeswary and a son named Mahendran Yogaraj Sundaram. While the children were very young, Ilavarasi Annammah died at a young age following the birth of her youngest child. She was a devoted wife and loving mother. Their mother’s death was an incurable loss and grief for them. After Ilavarasi Annammah’s death, the parents of Ilavarasan T. C. Arasaratnam, suggested that he should get married again. Few months later, Ilavarasan T. C. Arasaratnam married for a second time to Puranam of Kondavil. She was descended from a highly respectable family with wealth. They had two children, a son named Ananthan Puranaratnam and a daughter named Ranji. Ilavarasi Maheswary Arasaratnam, daughter of Ilavarasan T. C. Arasaratnam and Ilavarasi Annammah, was born in Jaffna. Ilavarasi Maheswary and her two younger sisters, Ilavarasi Yogeswary and Ilavarasi Rajeswary were educated at Holy Family Convent Ilavalai, Jaffna. It is one of the best convent schools in Jaffna. Rev. Mother M. Salome Reynaert of Belgium was the Mother Superior of the Convent in Ilavalai, and Rt. Rev. Dr. Jerome Emilianuspillai, OMI, was the Bishop of Jaffna. They also met their paternal relatives (Aunts) at school, two daughters of Landar Selladurai and a niece of Sir Chittampalam Gardiner and they spent many happy days with their relatives. Nesaratnam Selladurai was the daughter of Landar Selladurai and she studied at Holy Family Convent Ilavalai. Nesaratnam Selladurai converted to Catholicism and later she became a Roman Catholic nun and took the name Lumina. She was thereafter known as Sister Lumina. Ilavarasi Maheswary Arasaratnam was a bright and intelligent student and during her school days, she enjoyed such as music, painting and social events. She also had a great enthusiasm for sports. Ilavarasi Maheswary was a keen netball and tennis player and she has served as Captain for both teams. She was a House Captain (Peter House) and Head Prefect. Ilavarasi Maheswary Arasaratnam after completing her education, at the request of Rev. Mother Salome Reynaert (Mother Superior), she taught English at Little Flower Convent in Karampon and then in Point Pedro. She also taught at Teachers Training College in Jaffna. During her brief teaching career, she was held in high esteem by her colleagues and as well as her students. Ilavarasi Maheswary Arasaratnam was graced with beauty, very pale skin; she had an erect posture and long silky black hair. She was charming, graceful, admirable, strong willed and had a regal personality. She loved fine clothes, jewellery and she wore traditional Sari with a Pottu on her forehead. Her attire was glamorous and stylish, and she enjoyed an extremely privileged lifestyle. Ilavarasi Maheswary Arasaratnam married her first cousin, Thambirajah M. Kanagarajah, son of S. C. Thambirajah and Kolandavel Ponnambiki. The Ilavarasan Thambirajah Kanagarajah was well educated, pious, had a strong personality and was the Landed Proprietor of Ambagastenne Tea Estate in Pundaluoya. He also served in the Army with the Ceylon Royal Artillery during World War II. They had five children, three sons named Rajendra Sylvester, Meryll Venatious and Remigius and two daughters named Vanaja Maria Queenie and Jeraldine. They were raised under strict supervision of their parents. Unfortunately, their eldest son, Ilavarasan Rajendra Kanagarajah died at a very young age and he was laid to rest next to the tomb of his paternal grandmother Thirumathi Kolandavel Ponnambiki Thambirajah. Their second daughter, Ilavarasi Vanaja Kanagarajah married Sivathasan, son of Sabapathy Suppiah of Chavakachcheri. Later they moved to the Netherlands and they have three sons named Rajiendhar, Naveen and Pravin. In 2012, their eldest son, Rajiendhar Sivathasan married his first cousin, Akkila Clementine, daughter of Ilavarasan Meryll Kanagarajah and Chandramathy. Their third son, Ilavarasan Meryll Kanagarajah married Chandramathy, daughter of Kandiah. They have two daughters named Akkila Clementine and Achela Meloni. Their fourth daughter, Ilavarasi Jeraldine Kanagarajah married Jerom Prithiviraj Balachandran, son of Mahalingam Balachandran of Jaffna (Retired Chief Postmaster, Central Mail Exchange) and Angeline Balachandran (nee Goonawardene), she was the daughter of late A. W. N. Goodawardene of Artie - Moragoda Walawwa, Dodanduwa. They have a daughter named Maha Antoinette. Their fifth son, the Raja Remigius Kanagarajah in 2003, restored the traditions of the Arya Cakravartti Dynasty with the explicit approval of the family. On 15 June 2005, by the majority acclaim of representative members of the Royal Family of Jaffna, The Raja Remigius Kanagarajah took over the responsibility as the Head of the Royal Family of Jaffna, with a ceremonial position. The Raja Remigius Kanagarajah married Aishwary Rajnandhini Lusijah, daughter of Emmanuel Ratnajothi Rajaratnam of Nallur, Jaffna. By mutual consent the couple decided to separate officially in 2006. Ilavarasi Yogeswary Arasaratnam had a great interest in social work, loved music and was good at needlework. Ilavarasi Yogeswary Arasaratnam married Suppiah Kadiravel and they had a son named Mohanraj. Ilavarasi Rajeswary Arasaratnam enjoyed sports activities such as netball and table tennis. She participated twice in table tennis competition at District level and won prizes. Ilavarasi Rajeswary Arasaratnam underwent a Teachers Training program for three years at the Teachers Training College in Palali, Jaffna. After completing the teachers training program she commenced her teaching career and functioned as English Teacher at Little Flower Convent in Karampon, Kayts. Later she was appointed to the position of Vice-Principal in the same Convent. She was considered a strict disciplinarian and was held in high regard. Ilavarasi Rajeswary Arasaratnam married Anthonipillai, son of Soosaipillai Saverimuththu. They had three sons named Gerard Pius, Reginold Michael and Eugene Venesious. Ilavarasan Mahendran Yogaraj Sundaram Arasaratnam attended education at Stanley College Jaffna. He showed special interest in literature and had also been a good sportsman in his college days. Ilavarasan Mahendran Yogaraj Sundaram Arasaratnam was first married to Saratha. They had two daughters and two sons. In order from oldest to youngest, their names are Shanthi, Suresh, Nishantha Kumara and Dushanthi. Ilavarasan Mahendran married for a second time to Dorathy Mary, daughter of Arthur Leslie Melville of Scotland and Agnes Robert. They had a son named Rabindran. Ilavarasan T. C. Selvarajah was a keen sportsman from his youth, representing the school at football and cricket. He completed the Cambridge Examination in Jaffna, and at a young age, he proceeded to Malaya and continued his involvement in sports. Ilavarasan T. C. Selvarajah married Seetha Devi, daughter of Vallipuram Chelliah and Chellammah Muthiah of Nelliady. They had four children, three sons named Suseelan, Soman and Bahman and a daughter named Bahma and the family settled down in Malaya. Ilavarasan T. C. Nadarajah was first married to Punithavathani, daughter of Dr. Saravana Balasuriya of Jaffna. They had a daughter named Sivagnanam Sothy. Ilavarasan T. C. Nadarajah married for a second time to his first wife’s sister, Mathuram. They had no children and both wives lived in the same dwelling happily. Ilavarasan T. C. Thambirajah married Pahavathi Selvaratnam, daughter of Thillaiampalam Karthigesu of Manipay and he was the cousin of Thambiah Cadiravel Mudali. They had four daughters and two sons. In order from oldest to youngest, their names are Thavamani Devi, Jeyakumar, Vijayakumar, Jeevanayagi, Selvanayagi and Rajanayagi. Ilavarasi Vethavalli of Mathagal was the daughter of Pararajasinghan Mudali and granddaughter of Paranirupasinghan Mudali. She was also the great-granddaughter of Cinkai Pararacacekaran (1478-1519) and Valliammai Arasakesari. Ilavarasi Vethavalli was given in marriage to Thanabala Mudali, the Vellala Chief of Mathagal, son of Rajendra Mudali. Their second daughter married Mudaliyar Chidambaranatha II, son of Mudaliyar Chidambaranatha Narasinga Mappana. Their son Mudaliyar Chidambaranatha Sittampalam married Seethevipillai, daughter of Mudaliyar Rasasingham Karalasingham. Their son Sittampalam Thiruchelvarayar had a son named Karalapillai, and his daughter Santhiyal Karalapillai married Soosaipillai. They had a daughter named Mariamuttu Soosaipillai and she was married to Kanagaratnam. They had five children, three sons, namely, Mudaliyar Kanagaratnam Thambithurai, Sellathurai and Rajathurai and two daughters, namely, Nallammah and Muttammah. Mudaliyar Kanagaratnam Thambithurai was the son of Mariamuttu Soosaipillai and Kanagaratnam. He was an influential person, and was held in high regard by the people. “Cankili Thoppu” in Nallur, Jaffna, was the ancestral home of Mudaliyar Kanagaratnam Thambithurai. He married Nagammah of Nallur. Mudaliyar Kanagaratnam Thambithurai and Nagammah were Raja Remigius Kanagarajah’s maternal great-great grandparents. They had ten daughters and one son. Their seven daughter’s first names not known and other three daughters names were Annapoorani Nagamuttu, Valliammai and Thangamuttu and a son named Suliothayar. Their children were born and raised in “Cankili Thoppu” in Nallur, and they all got married into noble families of Jaffna. Proctor Suliothayar was the son of Mudaliyar Kanagaratnam Thambithurai and Nagammah. He was an eminent leading Proctor and established his practice in Nallur, Jaffna. Proctor Suliothayar took an active interest in religious matters, and was a popular person who was always of great help to the people of Jaffna. Landar Selladurai was the grandson of Mudaliyar Kanagaratnam Thambithurai and Nagammah. The title of "Landar" was conferred upon him and he was the first person to own a Horse-drawn carriage in Nallur. Valliammai was the daughter of Mudaliyar Kanagaratnam Thambithurai and Nagammah. Valliammai was given in marriage to Konamalai and he was a descendant of the Pandya Dynasty. Later the Konamalai family had settled down in Trincomalee. Muttu Sayamban (also known as Muttu Sayampu and Sayampu Master), the eldest son of Thangamuttu and Lakshmanan, was born in Nallur in 1866. Muttu Sayamban married Meenachchi of Chundikuli. In August 1888, Muttu Sayamban founded the Hindu English Vidyalayam in Karainagar. The name of the school was changed to Thirugnana Sambanda Murthi Nayanar Vidyalayam. In 1936 the school name was changed again to Karainagar Hindu College. Muttu Sayamban was a Master at the Hindu English Vidyalayam in Karainagar and later he became the Headmaster and remained there until his retirement in December 1931. He was inspired by Sri Arumuga Navalar of Nallur, like Arumuga Navalar, Muttu Sayamban master was dedicated to the cause and it used to be said, “What Sri Arumuga Navalar was in Jaffna, Muttu Sayamban was to Karainagar”. Sri Arumuga Navalar and Muttu Sayamban were visionaries driven by a passion to save the East from the pernicious aspects of Western culture. Sivakolunthu was the daughter of Thangamuttu and Lakshmanan, and the younger sister of Muttu Sayamban. Sivakolunthu was married to Gate Mudaliyar Muthuthamby son of Chellappa, who hailed from a distinguished and wealthy family. “Thamil Agham” is the ancestral home of the Gate Mudaliyar Muthuthamby family in Anaipanthy. The “Muthuthamby Lane” was named in his honour in Anaipanthy, Jaffna. Gate Mudaliyar Muthuthamby donated many books to the Jaffna Public Library, there were about 97,000 books and over 10,000 manuscripts and some of the books were priceless. All these precious collections were consigned to the flames when the Jaffna Public Library was burnt down in 1981. It was one of the largest libraries in South Asia. Chellammah Thambiah Nachchiyar, the youngest daughter of Vedanayagam Thambiah Mudali and the younger sister of Thambiah Cadiravel Mudali, was born in Manipay, Jaffna. Chellammah Thambiah Nachchiyar had her early education at home under the direct supervision and guidance of her mother and governess. Chellammah Thambiah Nachchiyar was Raja Remigius Kanagarajah’s maternal great-grandaunt and paternal great-grandmother. Chellammah Thambiah Nachchiyar was given in marriage to Zamindar Ramasamy Sangaralingam Caruppiahpillai of Kaveripoompattinam, India. Kaveripoompattinam also known as Poompuhar is located in Sirkali Taluk of Nagapattinam District in Tamil Nadu. It has a great historical importance and was once a flourishing ancient biggest port on the east coast and it was the Capital under the earlier Chola Kings. The greatness of the City is brought out in some of the poems in Sangam Literature and also by Silapathikaram, Manimekalai and Pattinappalai among the epics. "Pillai" was a Tamil title, conferred by the Arasan upon prominent Vellalar Chieftains and Feudal Lords during the time of Chola and Pandya Kingdoms. Chellammah Thambiah Nachchiyar and Zamindar Ramasamy Sangaralingam Caruppiahpillai had seven daughters and two sons. In order from oldest to youngest, their names are Periyathangam, Ponnuthangam, Annammah, Rasammah, Sinnathangam, S. C. Thambirajah, S. C. Rajaratnam, Sivapackiam and Ratnam. Their eldest daughter, Periyathangam was given in marriage to Ponniah Edwards alias John Edwards, son of Murugesu Kandiah of Point Pedro, and they had no children. Ponniah Edwards married for a second time to his first wife’s sister, Ponnuthangam. They had a daughter named Selvalakshmi Edwards. She was the first granddaughter born in the family. Ponniah Edwards was a wealthy person, owned many lands, the Heavenwewa Tea Factory and Eighteen Transport Lorries in Pundaluoya. He also made many charitable donations and built religious shrines. Annammah was married to Ilavarasan T. C. Arasaratnam son of Thambiah Cadiravel Mudali and Ilavarasi Annapoorani Nagamuttu. They had four children, three daughters named Maheswary, Yogeswary and Rajeswary and a son named Mahendran Yogaraj Sundaram. Unfortunately, their fourth daughter, Rasammah passed away at young age. The Rasammah Hindu Temple was built near the Mansion in Pundaluoya by Zamindar Ramasamy Sangaralingam in memory of his loving daughter Rasammah. Sinnathangam married Doraisamy and they had a daughter named Manni and she died as a young spinster. S. C. Rajaratnam married Annaratnam and they had four children, two daughters named Sivaneswary and Maheswary and two sons named Hari Pathmanathan and Pooneswaran. Sivapackiam married Arumugam and they had four daughters named Parameswary, Eaha (died a young spinster), Mohana and Suriya Kanthi. Ratnam married Thambirajah and they had three children, son (name not known), and two daughters named Pathma and Pushpa. Zamindar Ramasamy Sangaralingam Caruppiahpillai owned a large Mansion and Paddy fields in Manamadurai, India. The Mansion was surrounded by a beautiful garden and green paddy fields. It was located in Vellalar Theru (Vellalar Street) in Manamadurai. He also bought the entire village “Narikudi Grahamam”, which belongs to Virudhunagar District of South India. In the last decade of his life, he spent in the Mansion in Manamadurai and in Pundaluoya. S. C. Thambirajah was the sixth child and eldest son of Chellammah Thambiah Nachchiyar and Zamindar Ramasamy Sangaralingam. He was held in great respect by everyone. S. C. Thambirajah and S. C. Rajaratnam both brothers were well educated at Trinity College in Kandy. S. C. Thambirajah married Kolandavel Ponnambiki and they had five children, three sons named T. Selvarajah, T. Rajasingham and T. M. Kanagarajah and two daughters named T. Padmavathi Rasathi and T. Yogeswary. Unfortunately, their eldest son, T. Selvarajah died at the age of eighteen. S. C. Thambirajah and Kolandavel Ponnambiki were Raja Remigius Kanagarajah’s paternal grandparents. Kolandavel Ponnambiki had an uncle named Arunachalam (her mother’s brother), and Arunchalam’s daughter Baba was married to Robert Perera (erstwhile owner of Greenland Pharmacy). S. C. Thambirajah was pious and took part in all the religious ceremonies. During festivals and special occasions, musicians, poets and dancers were brought down from South India. Hindu festivals were celebrated in the most elaborate and grandest way. Sweets and gifts were also distributed to the people. The Rituals and traditions are handed down from generation to generation and Zamindar Sangaralingam’s eldest son S. C. Thambirajah continued the family customs and traditions. S. C. Thambirajah loved his wife Kolandavel Ponnambiki so much that he built a "Tomb" right in front of the Bungalow and laid her ashes in it. The tomb was designed by S. C. Thambirajah and it was built with such beauty and height that people could sight it from the next town and that is how they identified Pundaluoya. S. C. Thambirajah after performing his morning prayers he daily placed a Gardenia flower on her tomb. He made lavish contributions to charity, built other religious shrines and also donated lands to build temples. One of the Buddhist Temples still exists in Kadadorapitiya, Pundaluoya. The success and popularity of S. C. Thambirajah was so immense that, as a mark of respect following his passing, white flags were hoisted and all offices and shops were closed in Pundaluoya and nearby towns. Even though the Sovereignty of the Arya Cakravartti Dynasty ended, the Blue blood still flows through their veins.